2016 Weingut Korrell Johanneshof, Riesling Eiswein, Paradies, Bad Kreuznach, Nahe Germany. Korrell is one of the Nahe’s latest break out stars and every wine I’ve tried from Martin Korrell has been absolutely stunning, including this Eiswein. Crafted from old vines at their estate monopole Paradies Vineyard in Bad Kreuznach, from those grapes that hang out until the first freeze and were individual berry picked off the vine. Concentrated in sugars, but still bristling with natural acidity the gorgeous and opulent 2016 Korrell Eiswein Paradies goes on and on in mouth. Even with the residual sugar levels off the carts, this wine stays incredibly balanced and doesn’t drink as sweet as you’d imagine, making for a heavenly experience from its perfumed nose to its lingering tropical fruits. This is entrancing stuff with layers of lychee, candied pineapple, apricot jelly, honeycomb, lime blossom, white roses, chamomile, a hint of spearmint, mineral spice and cool wet stone. A rare and exotic, this Korrell Eiswein is treat beyond words, and while the Mosel is better known for sweet wines, I have found the Nahe in some vintages are more than equal, in fact I still think a contender for the greatest wine I ever tasted was one of Donnhoff’s version of Eiiswein from just up the river! While Tokaji and Sauternes grab sweet wine headlines, I honestly believe the Germans have them beat with TBA’s and Eiswein, because of the racy acidity that still remains in these Riesling beauties. Korrell used specially selected yeasts as there is no chance to do Sponti on the ultra concentrated Paradies Eiswein, it needs extra special attention to detail, Korrell adds, It is pressed in a special small press for sweet wines with low quantity, read tiny production, but not wooden because they don’t want too much air contact, to keep and preserve the exotic fruit aromas as much as possible as well as fresh details. 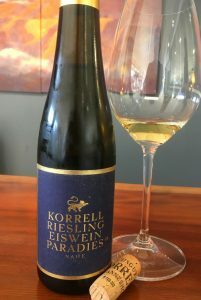 Tasted from 375ml, half bottle, the 2016 Korrell Paradies Eiswein is an amazing product, and sadly isn’t listed in the United States as of yet, though their Trocken(s) should be available later this spring or early summer, so remember this one for if and when you get to Germany.